This article covers 4 free search engines to find royalty free stock photos online. These search engines work as an image aggregation tool which fetches free stock photos from various sources and shows them at once place. Unsplash, Pexels, Pixabay, StockVault, iStock, Reshot, and Free Photos CC are the sources to name a few. While searching for free stock photos, you can select from which sources you like to get the results. In the results, you get thumbnails of the photos which are either sorted by the respective source or have the source mentioned somewhere. You can visit the original source of the photos and download them from there. While you are on the original source, do confirm the license and attribution requirement of the photos if any. This helps you avoid accidental use of photos which are either not royalty-free or require some sort of attribution. With that said, let’s check out these search engines one by one in details. When you run an image search query it reverts you back with results from all those websites. If you want photos from one specific source, you can filter out results based on the source. Pixel Mob has a gear-shaped icon right next to the search box. From this gear-menu, you can select the desired source to get the photos from that source only. In the results, it shows thumbnails of the image. When you hover the mouse cursor on top of a thumbnail, it shows you details (photo name, source & link) in a semi-transparent overlay on top. From there, you can preview the photo in high resolution and download it by visiting the source. Moreover, Pixel Mob has account support that lets you create a library of photos. This library option comes handy while browsing the photo. If you like a photo, you can add it to your library with a single tap and keep browsing without getting distracted. 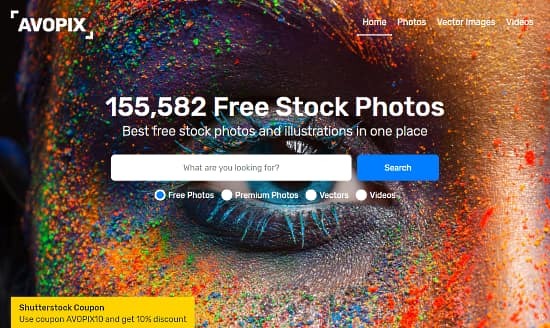 Give this free stock photo search engine a try here. 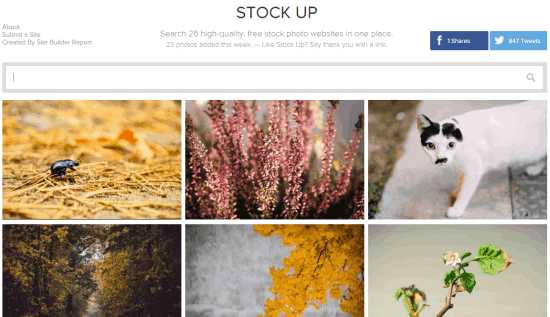 StockUp is another free stock photo search engine to find royalty free photos online. This search engine is powered by 31 stock photo websites and shows results from all those websites at one place. This is perfect for hunting royalty free photos for personal, professional, and commercial use. When you search a keyword on this website, it lists results from all websites showing thumbnails of the photos. You can get info (name, source, and license info) of each photo by hovering the mouse over the thumbnail. Tapping a thumbnail takes you to the original source from where you can download the photo in high resolution. If you have a free stock photo website that is not listed here, you can send the StockUp team an email requesting them to add your website to their index. You can try this free stock photo search engine here. The Stocks is a free website that binds numerous stock photo sources in one place. This website has a navigation panel on the left with a web-view area on the right. The navigation panel contains a list of stock photo websites. When you click a website, it opens that website on the right side web-view area where you can type your keyword search for free stock photos on that website. As this website open the native website for search, so, you won’t get results from multiple sources at once. It just provides you dozens of sources which you can quickly visit without going to a new tab. Apart from the photos, you can use this website to search for colors, icons, videos, mockups, and fonts as well. Give TheStocks a try here. AvoPix is another website to search stock photos online. This website has its own collection of thousands of stock photos along with Shutterstock integration. Apart from the free stock photos, you can use this website to search vectors, videos, and premium stock photos as well. 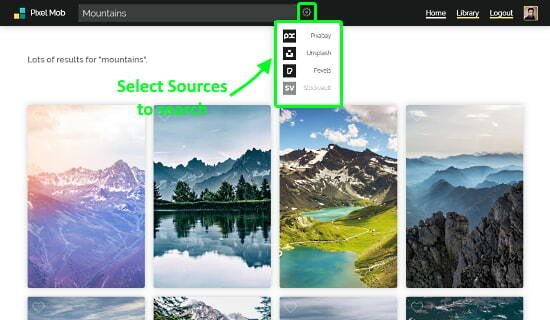 When you search photo on this website, it shows you the results in a two-grid layout; one grid containing the free stock photos and other containing premium photos. From the grid, you can simply click a photo to open it in high resolution and get other details about the photo e.g. dimension, colors, file size, license info, etc. From there, you can download the photo in high resolution. If you have to use the photo on a webpage, you can get the HTML embed code to add it to your webpage. Try AvoPix to find free stock photos online here. 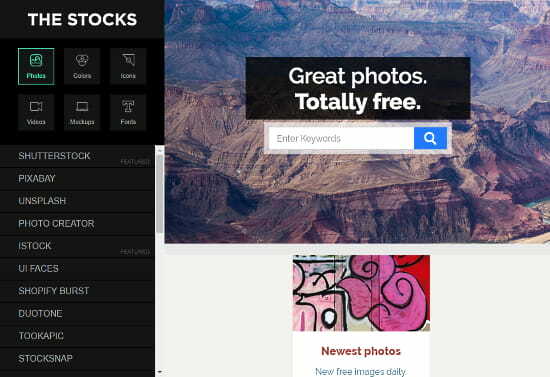 These are the 4 free stock photo search engine to find royalty free photos online. These search engines come handy to quickly hunt down a nice photo under Creative Commons Zero (public domain) license that can be used for professional and commercial use.